Maximize hair’s vibrancy during its daily cleanse with the Redken Color Extend Shampoo; an award-winning formula developed specifically for color-treated tresses. Effortlessly lathering through locks, the shampoo works to eliminate daily dirt, excess oil and impurities, whilst hydrating and conditioning the fiber due to an infusion of Cranberry Oil. 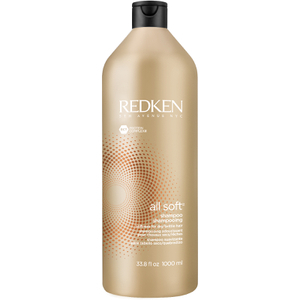 The cleanser harnesses the power of Redken’s Fade Resist Complex, which offers unsurpassed color protection. A micro-net, as well as UVA and UVB filters work in synergy to lock in color and shield colored hair from color-fading aggressors. Finished with a dose of Ceramide, the Color Extend Shampoo leaves hair strong, clean and healthy, alongside visibly vibrant and shiny. Apply to wet hair. Massage into a lather. Rinse thoroughly. For best results, follow with Color Extend Conditioner or Color Extend Rich Recovery. Aqua/Water/Eau, Sodium Laureth Sulfate, Cocamidopropyl, Betaine, Glycol Distearate, Sodium Chloride, Amodimethicone, PPG-5-Ceteh-20, Sodium Benzoate, Parfum/Fragrance, Salicylic Acid, Guar Hydroxypropyltrimonium Chloride, Trideceth-6, Carbomer, Cocamide Mipa, Butylphenyl Methylpropional, Hexyl Cinnamal, Cetrimonium Chloride, Linalool, Vaccinium Macrocarpon (Cranberry) Seed Oil, Arginine, 2-Oleamido-1, 3-Octadecanediol, Hydrolyzed Soy Protein, Benzo-Phenone-4, Citronellol, Benzyl Alcohol, Hydrolyzed Vegetable Protein PG-Propyl Silanetriol, Methyl Cocoate, Sodium Cocoate, Sodium Hydroxide, Citric Acid (D46209/2).